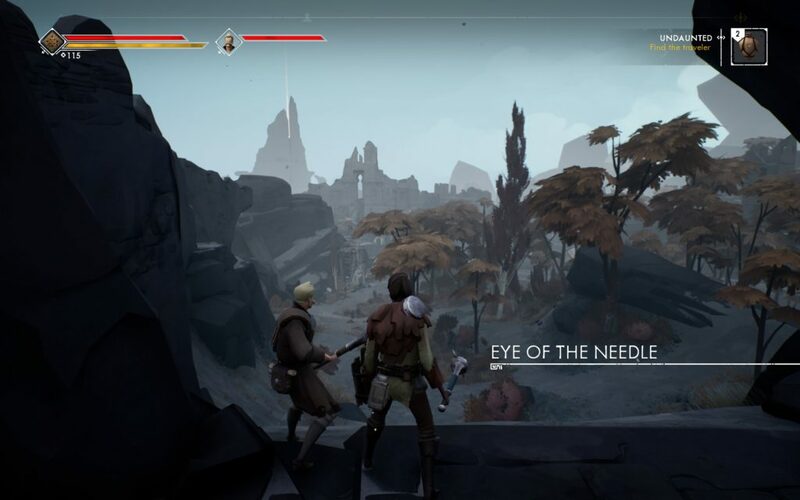 Ashen, the debut title by indie studio A44, wears its Dark Souls influence on its sleeve. It wants to be appealing to Souls fans, but also welcoming to newcomers. It smooths rough edges with a world map and quest tracking system, and it provides NPC allies along the way. When I picked it up to play with a friend, I was struck by how, despite the differences, it is utterly entangled with its Souls inspiration. It’s impossible for me to assess Ashen and its design decisions in a vacuum. This is partly because it wasn’t created in one: elements of its story and design are direct responses to their analogues in the Souls series. Ashen demonstrates how the Dark Souls formula provides a backdrop for interesting ideas, but can also obscure or dampen a game’s own identity. When we apply the term “soulslike” to a game, we contextualize it via comparison. As a label, “soulslike” comprises a fairly complex collection of mechanics, aesthetics, and design choices. It can be applied loosely, strictly, or anywhere in between. Unlike other modern subgenre labels (“masocore platformer”, “roguelike”, “metroidvania”), it tends to carry a lot more specificity. It implies a relationship to the Souls series. Where “roguelike” is a classification based on mechanics, “soulslike” is an invitation for comparison. 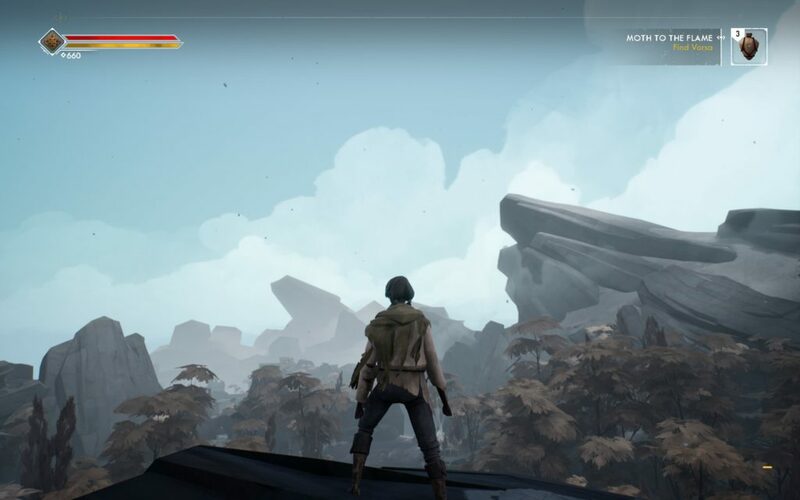 Ashen might be the most Souls-like soulslike released to date. It uses basic movement and combat verbs that are almost identical to souls games, right down to the way it maps them to controller inputs. It takes place in a word with similar aesthetics, themes, and ideas. Being constructed this way, it’s likely that many players approach Ashen as a function of Dark Souls. It comes across as a variation on existing formulae, inherently juxtaposed against the original. This relationship brings deviations into focus in a way that heightens them. It also, however, imposes certain limitations, barriers that the game can’t quite cross without, in some way, undermining its soulslike status. 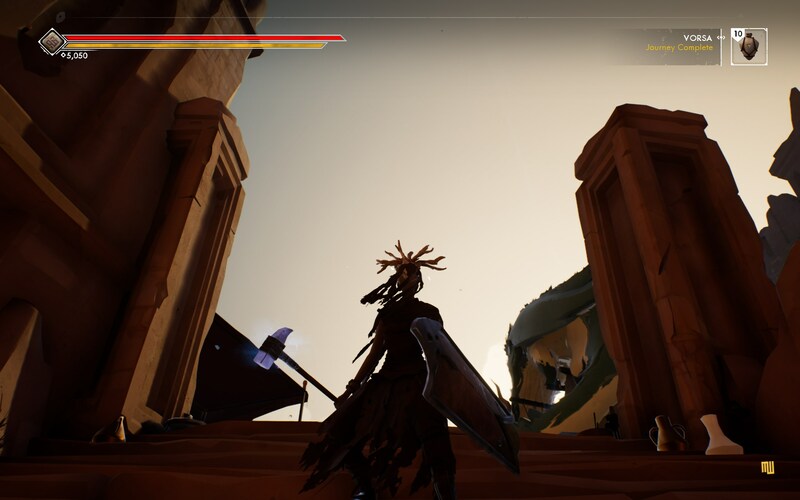 Ashen’s focal variation on the soulslike formula is the emphasis it places on cooperative play. By default, the game will automatically pair up players who are at similar points in the game (similarly to Journey). The idea is to invite players to work together with the strangers they encounter by chance. If the setting is disabled, or if no compatible match has yet been made, the player is (by default) accompanied by an NPC ally. Ashen never wants you to be alone unless you go out of your way to do so. Enemy grouping and placement is typically balanced against two characters, making for an extraordinary challenge for those who disable these features. Optionally, players can introduce a matchmaking code that will let them play the majority of the game with a specific friend. This co-op-first design is a stark contrast to the Souls games, which feel like they offer co-op as primarily an opt-in difficulty tuner. The canonical Souls experience is largely solo (with help when needed or wanted), while Ashen’s is cooperative. Because of this, Ashen scratches an itch that the Souls games do a poor job of addressing: the ability to conquer an entire experience together with other people. 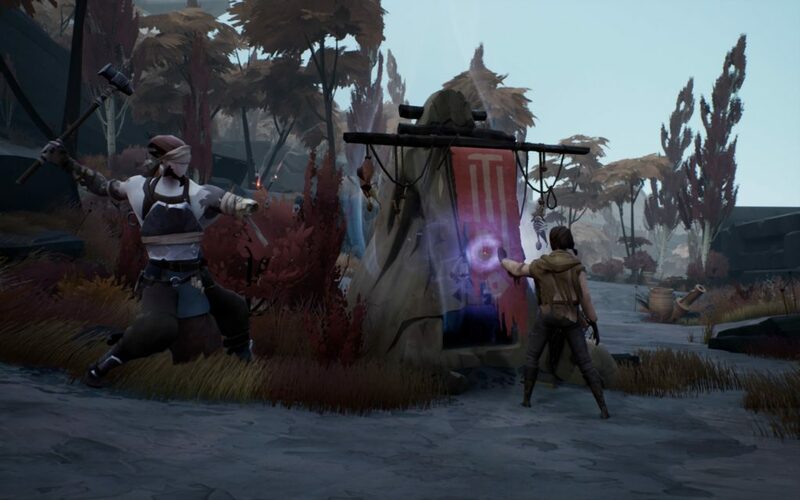 As it progresses, Ashen’s encouragement of co-op extends to a commentary on cooperation and community. Progressing through the game allows players to recruit more folks to their town, who slowly build it up from a collection of crumbling ruins to a warm and welcoming village. It’s here that Ashen most strongly pushes against the Souls games that inspired it. Souls titles are notoriously gloomy, tragic, and peppered with untrustworthy NPCs. They generally involve the player meeting fellow wanderers and then witnessing their deaths, betrayals, or descents into madness (or combinations thereof). When players summon allies, they appear as phantoms, never truly inhabiting the same reality as the player. To those who play both, Ashen’s relationship to the Souls series ultimately emphasizes its faith in community. Sure, it still communicates the message on its own. But in the context of its Souls DNA, it does so insistently, rebelliously. And to those who came to Ashen from the Souls series, it may land more powerfully because of its awareness of this context. In a broader sense, Ashen also feels like much of its aesthetic was molded from a soulslike template. Its somber and quiet and often understated, reveling in moments of quiet awe. Like the Souls games, it downplays textural details in favor of striking uses of lighting. It characterizes and distinguishes NPCs through garb and pose. Its spaces feel lonely, but beautiful. In the end, the game’s aesthetic is thoroughly its own, but it often feels like it was evolved from its Souls inspiration in meaningful ways. While Ashen is characterized substantially by its deviations from Dark Souls, it also often feels constrained by its adherences. There are points where the game dabbles with expanded crafting mechanics, diverse upgrade effects, or elements of metroidvania design. I should be clear that most of my impressions about these mechanics are speculative, but they did dome to mind as I played through the game. Take, for example, the armor and shields that can be found throughout the world. At first they consist of increasingly stark tradeoffs between defense and stamina management. In the final areas, however, those give way to a few pickups that are just outright superior. The game seems determined to force players to deliberate about tradeoffs, but the system lacks the complexity to maintain those deliberations. If Ashen made this concession earlier, it could have interspersed “hmm, is this worth it?” pickups with “oh, this is just better all around!” ones, rather than simply backloading the latter kind. To me, this felt like an attempt to encourage build diversity without quite having the mechanical complexity to follow through. Another example is about halfway through the game, where a large wall completely blocks the player’s path until they complete a nearby quest and get a new ability. This ability is then awkwardly tacked onto existing mechanics and is woefully under-explored, consisting only of random spots where an attentive player may use it to reach a hidden item. What could this mechanic have been if Ashen was willing to add meaningful movement abilities, entirely new verbs, that changed how the player navigated the world? Could it have built a more compelling world with a metroidvania approach, with ability gates, unlockable abilities, and clever shortcuts? Ultimately, the game wanted to have a neat new ability to introduce, but didn’t quite want to betray a commitment to unchanging player capabilities. Souls games don’t give you cool powerups that let you dash around or jump higher. They establish rules and stick to them. The only way to get any type of unique capabilities is to find equipment that grants them and commit to using that equipment. Players don’t just get boons that give them new tricks. Ashen, however, does want to give you this sort of powerup, but only once, and only sort of. It’s possible this came down to time and resource constraints, but to me it felt like uncertain identity. Item placement throughout the world also felt like it was using obligatory soulslike practices. There is a ton of loot to grab from the various ledges, caves, and shadowy corners across the world. Any player that attempts to be thorough will overflow their inventory with items they only needed in small quantities. I’m not going to upgrade a dozen weapons to +5; I have neither the interest nor the currency to do so. At times my friend and I wondered: why not just have meaningless collectibles? Tracking down precariously-placed or well-hidden items was totally satisfying in its own right! I would have enjoyed finding “Cool Orb #18 of 25” a lot more than finding a 40th Sapient Root I didn’t need. To me, it felt as if Ashen was promising to make every item matter, even when its item economy didn’t justify the abundance. So altogether, a number of mechanics felt like incomplete attempts to reach beyond genre trappings. They were interesting, but didn’t quite mesh together correctly or align with the overall length of the game. Surely some decisions were made to keep things moving, but a lot of it feels like misplaced loyalty to the soulslike formula. Should we Use the “Soulslike” Label? “Soulslike” still strikes me as a relatively unique label. Personally, I feel that there is (and should be) room for “Dark Souls, but X” approaches to design. Branching off from significant works, particularly ones that define subgenres, is vital to iterating on these experiences and dissecting what makes them compelling. Playing other Souls-style action RPGs like Nioh or The Surge helps us understand what we do and don’t like about both the differences and the similarities of these types of games. So to me, the label can provide helpful context from a critical perspective, but might be limiting when deployed as an overall design philosophy. On the whole, Ashen was totally successful for me. I rarely find opportunities to play games with friends, playing it was a great excuse to reconnect with a college buddy I don’t see often. We enjoyed ourselves enough to push through even the worst quirks of the multiplayer design and make it to the end. But I can’t help but wonder if Ashen could have been even more interesting if it had taken more liberties, if it had more confidently forged its own identity. Hopefully, A44 finds more room to experiment in future expansions or new projects. And more broadly, I hope that even games with very obvious inspirations can continue to find audiences without being beholden to genre expectations.